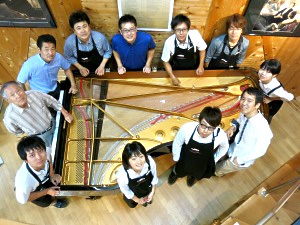 The Nagoya Piano Choritsu Center is a piano dealership founded in 1973 in Aichi, JAPAN. After starting business as a repair shop that included piano tuning, we launched into piano sales to meet our customer’s demands. Today, we are an authorized distributor of Steinway pianos, the finest pianos in the world. We deal in every aspect of acoustic pianos, including secondhand instruments and tuning. We also have a craft center available for large-scale repairs such as replacement of hammers or strings and painting operations. When selecting a quality instrument, actually playing real pianos is the most important part of the process. We make efforts to enrich our show floor, especially for grand pianos, so that customers can try out and compare many instruments. As we always have about a hundred pianos on display at any given time, you can play a wide variety of models to find the one that best suits your needs and taste. We have considerable experience in distributing pianos and providing services for concert halls, hotels, restaurants, music schools, and individual clients. Please feel free to pay us a visit at our shop. We always welcome inquiries from beginners and experts alike. Copyright © NAGOYA PIANO CHORITSU CENTER LTD. All Rights Reserved.